Blue Cheese by Barney's Farm is a great looking, compact cannabis plant with Big Buddha Cheese and Blueberry heritage. A clash between the strong cheesy aroma with the smooth, fruity fragrance, created an unmistakeable, exotic experience. It takes scarcely little time to develop those magnificent, 24% THC rich buds - the Barney's Farm feminized LSD is ready for harvest after just 60 to 70 days of flowering. 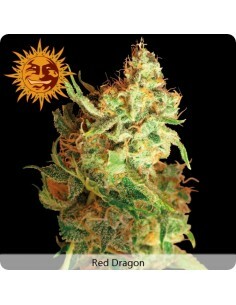 A powerful Indica dominant hybrid, born from the best Skunk and Mazar cannabis plants. Tangerine Dream is a complex cross with the G13 and Neville's A5 Haze that resulted in an ultra high yielding strain with amazing THC content of 25%. Easy to grow and fast blooming, producing a mixed high with a cheerful boost slowly morphing into a lasting stone. Top Dawg is an hybrid cross of a Mexican Sativa with an Afghan strain. The plant has a distinct pineapple smell and taste. The Afghan Kush genetics give it a strong stone effect. Top Dawg smells a lot when growing and flowering. It produces large thick buds that are easy to manicure. Triple Cheese from Barney's Farm possesses pace, power and pungency all in equal measure. This heavenly Indica mixes the superb Blue Cheese with the awe-inspiring Original Cheese; resulting in a specimen all Indica addicts will love. Very easy to grow, Triple Cheese manages to appeal to growers of all levels. As for the plant itself, cultivating it is as easy and straightforward as it gets. To put it simply, the Barney's Farm feminized Utopia Haze grows on its own, with scarcely any help. Growing below one meter (80-90 cm) it takes some 10 to 11 weeks to bloom. Once ready for harvest, it offers really abundant yields. Violator Kush feminized matures as a beautiful plant with big dark green leaves and an enormous amount of trichomes looking like silver frost. Flowering time is relatively short (from 8 to 9 weeks) and after that time all weed aficionados should expect heavy crops of good quality and marijuana that contains 22% THC and 1,3% CBD. A Barney’s Farm / CBD Crew Collaboration.CBD Blue Shark is an Indica dominant strain created by a cross of Skunk #1 and CBD Enhanced. Blueberry was crossed with the classic Shark Shock and finally bred with our CBD enriched Sativa to give this outstanding result.